Looking to learn more about Hearthstone's eleventh expansion? Visit the expansion guide for Rise of Shadows! meh, good zul'jhin card especially if it also adds another copy to hand as the twinspell effect but standalone only decent. it looks like a decent midrange card, great in wild spell hunter, that's for sure. it's a high value card, 5/5 rush is around 4.5 mana (militia commander), but you get for 1.5 "draw a card"
don't really like the card, i guess Zul'jin make it bit better. Didn't think about Zul'jin. This card is very strong. weak on its own but insane with Zul'jin. we now have enough minion generating spells to make him a big swing again. now pair that with Dire frenzy and you can get a lot of lategame value in Hunter (a possible substitute for DK and also a good way to counter warriors). You can build the remaining deck either with some secrets or even Secret Plan as a flex option and even more ressources later on. Maybe include Subject 9 for more drawing power or just run a regular midrange build, maybe even just ditch the Master's call and go for mechs instead. The card istself isn't that impressive but it adds a lot of possibilities for deck building. I tried having fun once. It was awful. It is kind of similar to Amani War Bear and you can cast it twice, so I don't think it is that bad, will probably see play in Zul'Jin based decks. how is a 5/5 rush minion worth 4.5 mana!?!? Militia Commander was 4 mana because the 5 attack could not go face. it could only trade for the 5 attack. this can hit your opponents face for 5 damage. and therefore, is worth more mana. If I were balancing the universe, I would consider fun. To all people saying this card is bad - remember how good was Zuljin when he summoned 4 3/3 wolfs ? 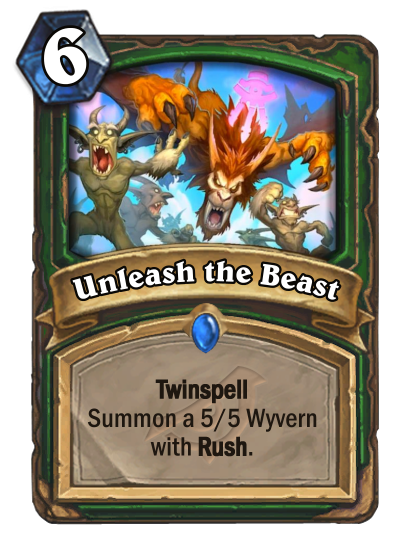 this is that except Zuljin will summon 5/5 rush Wyverns and give two more copies of this spell to the hand. Huh, I guess Zul'jin just got some support after all. I think the card is alright. It's not your everyday busted tier1 card, but it's strong. Seems weak in a vacuum. 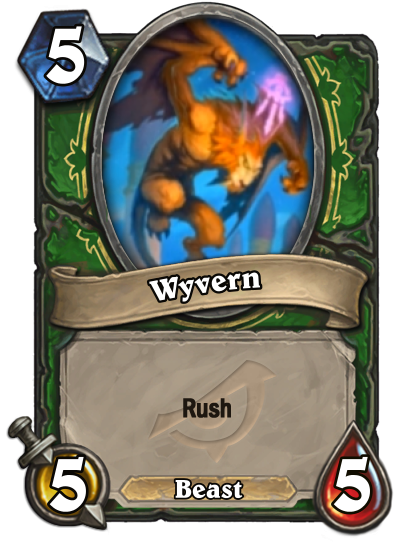 5/5 rush is definitely not worth 6 mana and card generation does not have the same value as card draw. It's pretty insane with Zul'Jin, summoning two Wyverns for free and adding the secondary spell to your hand. cause I take the temporal +3 attack as being worth. militia commander can't hit face with the +3 attack. for this card to see play in constructed without a spell it would need to cost 4 in pre rotation meta or 5 in post rotation meta, it costing 6 is worse tempo but it has much better value. Militia Commander is a rediculously strong card on purpose. Warrior is meant to be the king of rush. You can't balantly say that this is bad because the other card is more efficient, it's another class. For instance, warrior doesn't have Zul'jin, which is where this card gets a large part of his power from. Glad this is rare btw. And @OP: where is the vote? 5/6 is a vanilla cost for 5 mana minion. 5/5 is worth 4.5 mana. Rush effect is worth roughly 2 points of stats, charge is 3. So what you get is basically a 6/6 for 6 that you can cast twice. But the strength lies in Zul'jin for this one. one more copy, since only one of the cast spells will have twin spells, unless you used a second copy.